Special needs rabbits. The phrase calls up images of rabbits with various permanent disabilities: deaf, blind, splay-legged, paralyzed. Without doubt, such rabbits belong in this category. Yet any one of our rabbits could become a special needs rabbit should it become ill or if it should simply live until it develops some of the infirmities of old age. This is a bit of a sobering thought, but the good news is that more and more rabbits with disabilities are living happy and fulfilled lives. Many people who never dreamed they would be capable of caring for a special needs rabbit are finding it to be a tremendously rewarding experience. There is no question that caring for a special needs rabbit entails a lot of hard work, but those who take on the challenge invariably find it worth every second spent. They also find many of their pre-conceived ideas about special needs rabbits are changed. Anyone who is around these rabbits any length of time learns that the natural spunkiness so evident in all rabbits is especially evident in special needs rabbits. Amy Spintman, an educator with the San Diego Chapter of the House Rabbit Society, cares for both an older rabbit, Dolce, and Bijou, a rabbit who has lost the function of her legs. Amy comments that after seeing Bijou people are ". . . amazed at how interactive and responsive she is with me and can see that she still has a zest for life and a will to live." In fact, contrary to what one might expect, caregivers often report that their special needs rabbits are the happiest and most affectionate of their rabbits. This is simple enough to verify: ask yourself what the behaviors of a normal happy rabbit are - they are playful and affectionate, they tooth purr, dance, lick, and toss their heads. If you see those same behaviors in a special needs rabbit it means the same thing. Rabbits do not dissimulate. All special needs rabbits are basically like any other rabbit; they just require a bit of extra love and care. Open your heart and let go of your assumptions about disabilities if you find yourself caring for a special needs bunny. You will find it endlessly rewarding and will most likely develop a deep and lasting bond with your special bun, far deeper than you ever developed with one of your normal rabbits. Nor will your rabbit be the only one who benefits. K. Marie Mead, author of a forthcoming book of true stories about house rabbits, cares for Kali, a rescued rabbit with multiple disabilities. "Kali is a teacher, a healer. I've gained a depth of compassion that I never had before, and that new-found strength has enabled me to work with humans and non-humans in a different and better, manner. Kali is a cherished gift, and more - she is a paradox of the highest level, from which I'm still learning." Caring for a special needs rabbit may seem daunting at first, but there are a few simple actions you can take to make the life of the bunny easier. These apply whether your special needs rabbit requires extra care for a few days or several years. First is the close monitoring of food and water. Water should be plentiful and clean. A rabbit who normally takes his water from a sipper bottle may it find it easier to drink from a bowl instead, or vice versa. If the rabbit is unable to move around easily, it helps to hold a bowl of water up to the rabbit's face several times a day. A little sugarless fruit juice added to the water can help entice the bunny to drink. Should the rabbit not drink enough water on his own, he may need to be hydrated. Your veterinarian can do this for you or teach you to do it. Weight loss can be a problem. If the rabbit shows no sign of excessive sludge in its urine, weight loss can sometimes be slowed by allowing unlimited alfalfa pellets. (Note: some weight loss is inevitable in paralyzed rabbits because of muscle atrophy.) If the rabbit has difficulty eating, pellets can be pulverized and mixed with water or a special formula such as Oxbow's Critical Care given. Critical Care also contains ingredients that help stimulate the rabbit's appetite. Jars of organic baby food such as carrots or no-sugar-added fruits may also come in handy. They can be especially useful when teaching a rabbit to take food by a syringe, because most rabbits find them very tasty. Remember to syringe feed a rabbit by inserting the tip of the syringe into the side of the rabbit's mouth and slowly squeezing about a cc of food into the mouth at a time. In the past it has been recommended that rabbits be fed their own cecotrophs if they are unable to reach them themselves, and, in the case of a very ill rabbit, many veterinarians and rabbit caretakers believed it to be beneficial to feed cecotrophs from a healthy rabbit. Now some veterinarians are beginning to question the usefulness of feeding a rabbit cecotrophs, although others still believe it to be beneficial. If you have a healthy rabbit from whom to collect the cecotrophs and your ailing rabbit does not fight eating them, it would not harm the rabbit and could possibly help it. Pain relief is essential in the care of any special needs rabbit. Rabbits in general do not tolerate pain well, but it has been found that veterinarians do not prescribe pain medications for rabbits as often as they do for cats and dogs. Therefore you will need to monitor your rabbit very closely for signs of pain such as tooth grinding and sitting hunched in a corner. If you do observe any signs of pain, request your veterinarian to prescribe a medication for pain relief. Cleanliness is also very important. Rabbits are naturally clean animals, and if their illness or a condition such as arthritis prevents the rabbit cleaning himself, you will need to do it for him. Brush or comb the rabbit daily. Clean out his ear wax if the rabbit is unable to clean his ears himself with his hind feet. Soften dried-on feces in the rabbit's fur with warm water or Novalsan® Otic Solution and remove the softened feces with care, as a rabbit's skin is very delicate. Pulling too hard on the fur can damage sensitive skin. If the rabbit has urinary incontinence, watch for the reddening and irritation of urine scald in the genital area and on the soles of the feet. This can be treated with bag balm and Neosporin® (not Neosporin Plus®). Extra attention is another vital necessity for special needs rabbits. Rabbits are extremely social animals, and their need for companionship does not leave when a rabbit is ill or incapacitated. If you are forced to separate a rabbit from his bunny friends because of a contagious disease or severe condition, you will need to make up for the lost companionship yourself. Rabbits given attention have been found to recover from illnesses more quickly and with fewer complications than those who are not. Caring for a special needs rabbit short-term is something most of us can cope with; long-term care requires a large commitment of time, money, and patience. It is hard work, and one disability will often lead to other physical problems as well. Providing the necessary care will definitely tie you down. 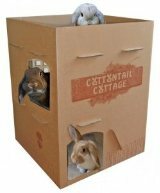 It is often hard enough to find a knowledgeable rabbit sitter for a healthy rabbit, and finding one capable of caring for special needs rabbits may prove impossible. With work and family commitments what they are for most of us, not everyone's personal circumstances will allow them to take on such time-consuming care. But for the individual who can and does take on this challenge, the results are immeasurably rewarding. "It's been a lot of work caring for my disabled and older rabbits, but they all continue to have a good quality of life," Amy Spintman comments. "As long as they are happy, I will continue to do whatever is necessary to keep them clean, comfortable, and happy." There are many conditions that require special care long-term, including loss of sight or hearing, paralysis, chronic bacterial infection, stroke, and cancer. Nor should we forget those rabbits that have been abused and are psychologically traumatized. These rabbits also require special long-term care. Following are some of the more common disabilities among rabbits and a few tips on coping with them. Hearing loss. A deaf rabbit will startle easily and be frightened by the sudden appearance of someone he didn't hear coming. For a prey animal such as a rabbit this is especially frightening. Approach a deaf rabbit slowly, from a direction where he can see you. K. Marie Mead discovered that a deaf rabbit is unable to pick up vibrations from some flooring (tile on cement slab) as well as they do from others (wood), and developed a system of hand claps to communicate with her rabbit Kali. Blindness. Rabbits in general adapt well to loss of sight. As long as you are careful not to move objects from their usual places, your rabbit will likely get around so well you will forget he can't see. Exert caution about letting strange rabbits, cats, dogs, or people in a blind rabbit's territory. Be aware that white New Zealand rabbits may develop an inherited form of glaucoma relatively early in life that could lead to loss of sight. Old age: Older rabbits suffer from some of the same infirmities older people do. Arthritis and osteoporosis are common, and some loss of hearing and sight are not unusual. It will become difficult for your older bun to get around as easily as he once did. He may need ramps to get up stairs or onto his favorite furniture, and he may require low-sided litter boxes. If the bunny is unable to bend back and eat his cecotrophs, you will need to collect them with a tissue and feed them to him so he doesn't lose their vital nutrients. An older bun will also need your help grooming. Comb or brush the rabbit frequently. Check for any matted feces and clean as described above under general care. Nails may start to turn outward and will need to be kept trimmed. Arthritis and spondylosis (development of bony protrusions that may bridge and fuse joints) will likely cause pain that will have to be treated with medications. In general, non-steroidal pain medications are not as hard on rabbits as steroids. Steroidal pain medications can have several negative side effects. Older rabbits may not eat as much as they once did, and they are at higher risk for gastrointestinal stasis, or the slowdown of the digestive tract. Be alert for the signs of GI stasis - small droppings, no droppings, and loss of appetite. Encourage your rabbit to eat and provide plenty of water and hay. Less food consumed may also mean teeth do not wear down sufficiently. If the teeth get too long the rabbit will have trouble eating and spurs may develop on the molars, causing sores inside the mouth. Ask your veterinarian to check your older rabbits' teeth for overgrowth, and have the teeth burred when needed. Paralysis: Unfortunately, paralyzed rabbits are among the most common special needs rabbits. Because of their light skeletons and powerful muscles, broken backs are not an uncommon injury and loss of use of rear limbs frequently results. Rabbits may also lose the use of their limbs from spondylosis, dislocated hips, diseases such as toxoplasmosis and encephalitozoonosis, and congenital deformities such as splayleg. The encouraging news is that more of these rabbits are being cared for long-term, and the quality of those lives can be very high. Given their reduced mobility and incontinence, special bedding is the first need of a rabbit with paralysis. Experienced caregivers of rabbits extol synthetic sheepskin - it is soft, wicks moisture away from the rabbit's body, and can withstand repeated washings. However, an absorbent layer such as a cotton towel will be needed underneath it. Egg crate foam underneath the synthetic sheepskin can help prevent the development of pressure sores. A doughnut-shaped cushion can be used to help provide support for the head. Place a commercial bed pad for incontinent persons or some other waterproof barrier beneath the other bedding. Several companies make carts for rabbits that retain the use of their forelimbs, and the majority of rabbits apparently adapt quite well to using them. Other rabbits learn to scoot around without any aids. Even a rabbit that has lost the use of all four limbs can have a quality life, as is attested to by many who have cared for such rabbits for months or years. For those rabbits that cannot be fitted with a cart, a mobile platform can be made. Attach a low rim to an 18" X 36" wooden base, affix wheels to the bottom, and bunny's mobile home is ready. Place bedding, water, food, and toys on the platform, and bunny can be wheeled from one area to another so he is not left out of things. Other caretakers prefer using a large soft dog bed (don't use one filled with cedar shavings) and carry bunny and bed room-to-room. Urinary incontinence may cause the paralyzed rabbit's skin to burn and become infected. This can be prevented by a daily bathing of the rabbit's hindquarters, periodic expression of the rabbit's bladder, and/or use of rabbit diapers. Helping the rabbit to empty its bladder frequently is perhaps the easiest. Hold the rabbit over a pad or plastic container and press gently on the bladder. (If the bladder does not empty, do not press hard, as this could rupture the bladder. Consult with a veterinarian.) If performed 2-4 times per day, expressing the bladder will help keep both the rabbit and his bedding clean and dry. Diapers can also be cut and fitted to a rabbit to help keep him dry. Surprisingly, some rabbits appear to accept the cumbersome diapers quite well. Whether the bladder is expressed and/or diapers are used, the hindquarters of a paralyzed rabbit will probably need to be bathed occasionally. Support the rabbit in a plastic basin, apply rabbit shampoo to the soiled area, massage gently, and rinse with warm water. Dry with a towel followed by air-drying with a hairdryer set on its lowest heat and held from a distance of at least 15 inches. Most rabbits learn to tolerate this washing, seeming to appreciate it is being done to help them feel better. Some caretakers choose to shave the hindquarters to make cleaning easier, but this should be done very carefully to prevent injury to the rabbit's delicate skin. Don't forget the rabbit's need for mental stimulation. In addition to lots of attention from you, the paralyzed bunny will require the added stimulation of toys and new experiences. Provide small toys such as a ring toss the bunny can throw, or a small ball with a bell. A companion rabbit can also be very helpful in improving the quality of life for your special needs bunny, especially if your work keeps you away from your rabbit for hours each day. Older, calmer rabbits are a good choice for a companion rabbit. Ask your local House Rabbit Society or rabbit rescue organization, and they may be able to recommend such a rabbit and even let you take one on a trial basis before committing to an adoption. Some caretakers of long-term special needs rabbits have found alternative aids and treatments to be of help in alleviating pain and increasing the rabbit's enjoyment of life. Be aware, however, that excessive use of any of the following non-traditional treatments can have a negative effect. There may be a tendency to overuse them because no actual medication is involved. These methods are most helpful when used in moderation and in conjunction with conventional treatments. Massage: This is perhaps the most commonly used alternative treatment for rabbits. There are both books and websites with detailed instructions on how to give your rabbit a massage. Always be aware of the delicate nature of a rabbit's skin and bones when giving a massage. Use gentle fingertip pressure applied in small circular motions. Flower essences: These are not essential oils, but flower "essences" usually preserved in alcohol - Bach's Flower Remedies are perhaps the most famous. A drop or two of the essence are put into the rabbit's drinking water, or the top of the rabbit's head or nape of the neck wetted with a few drops. After a week or two of consistent use, some rabbit caretakers claim to see positive results. Different formulations are purported to have calming effects and to aid in the relief of pain. Essences especially formulated for rabbits are available through some rabbit supply businesses. Colored lights: Colored light therapy has been used for many years. It is based on the idea that there are physiological effects on the body from differing colors of light because light is absorbed by the skin to varying depths. The use of special full-spectrum lamps with filters is not recommended for rabbits, but you can obtain the same effects by using colored light bulbs. Filling colored glass bottles or bowls and placing them where light passes through and reflects into the rabbit's room is also effective. K. Marie Mead has found using different true-to-color cotton cloths to be effective. "Putting a variety of colored material on the floor allows Kali to take color treatment on her own; she rests on the color she needs." Acupuncture: Needles are inserted at specific points of the body in order to affect other areas of the body and balance the energy flow. This should only be done by a licensed veterinary acupuncturist familiar with rabbits. Acupuncturists more familiar with cats and dogs may misplace needles, causing the rabbit pain. The insertion of properly placed needles apparently causes very little pain to the rabbit, and once in the needles are painless. They are left in place for times ranging from a few seconds to thirty minutes. Sessions are usually more frequent at the beginning of a treatment program, and then are reduced to a maintenance program of 2-4 treatments per year. For the first 48 hours after a treatment the condition being treated may appear to worsen, but within another day many caretakers report seeing an improvement. Acupuncture has been used to treat a variety of conditions in rabbits, including inflammation, arthritis, paralysis, gastrointestinal conditions, and chronic pain. Other alternative treatments. There are several other non-traditional healing methods that may be helpful with special needs rabbits. K. Marie Mead has found music therapy, visualization, and meditation to be effective in treating her rabbit Kali. Although Kali is deaf, K. Marie has found she responds to the harmonic vibrations of music, preferring soothing classical and new age selections. Positive visualizations and meditations surround Kali with love and support and promote healing. Whatever combinations of traditional and non-traditional treatments you use for your rabbit, there will be ups and downs. Typically a rabbit with a long-term disability may seem to be responding quite well to a particular method and then suddenly appear to regress. This is to be expected, so don't become discouraged. If one method of treatment seems to have lost its effectiveness, try another. As long as your rabbit has enjoyment of life and fights to go on, don't give up. Whether you care for your special needs rabbit for a single day or several years, be prepared for it to be one of the most fulfilling experiences of your life.